Watching Pig Iron Theatre Company's latest marvel, a scientific, cerebral, silly assault on traditional theatre is much like waking up displaced outside a fin de siecle dream. Chekhov Lizardbrain, in World Premiere, more or less concerns a number of things. One stated influence is animal behaviorist Temple Grandin's Animals in Translation. Grandin's autism led her to suggest that the interpreting activity of the normal human brain trumps its own understanding of the reality known by other mammals, thus limiting human perception. Another credited source is Paul D. MacLean's work on brain evolution and behavior. Chekhov Lizardbrain is shaped around MacLean's Triune Brain Theory, which identifies three separate brain layers within the human brain: The pre-human lizard brain, the instinctual and emotional middle brain —like a dog brain, and the modern human brain, which is capable of reason and higher symbolic communication. The narrator, Chekhov Lizardbrain (James Sugg), introduces the triune brain idea and three brothers, who are somehow Chekhov's Three Sisters. Otherwise formally attired in late 19th century top hats and moustaches, the brothers are without dress shirts and pants. Although symbolically peeled down to basics in ancient long underwear, they nevertheless add a layer of overt artiness. Not unlike the stasis in The Three Sisters, the brothers are caught between the past and the future at the century's turn. They exist inside a distilled Chekhovian fragment, which serves as a gossamer plot: Something must be done about their shared property, a decision must be made. The action ensues and one brother is betrayed. "Bertayal," Chekhov Lizardbrain says, " is part of the daily routine." Geoff Sobelle is Sascha, lizard brain; Gabriel Quinn Bauriedel is Pyotor, middleman and paleomammalian brain; Dito van Reigersberg is Nikolai, modern brain. Strangely, with three skilled performers, it is not always easy to differentiate among them. At times they seem to be interchangeable Rain Men. 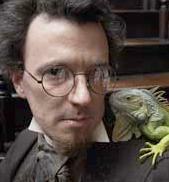 Chekhov Lizardbrain is a narrator with a psychological dilemma. The most articulated of the characters, he is of two minds, caught between being the narrator and alternately, Dmitri, the anxious prospective buyer of the brothers' house. Sugg is fascinating to watch, for he can turn from one character into the other and back instantly. Hyper-specific, he attends to little noises and sounds, details, repetition, and triggers. His narrator makes a point of explaining that there is a distinction between the idea of a thing and the thing itself-- very Whorf-Sapir, very Brecht. This is pretty cerebral stuff for physical theatre, or perhaps more correctly in this case, it's cranial stuff. The fifth actor is not a person, but a tree. Pig Iron is not about individual performance. Here their movement resembles a crazed, stilted comic dance, and their language is not conversation. Difficult to categorize, they could be playing at Chekhov via action and inaction. The rhythm of their motion often is hesitant, as if they want to take it back and do it again. In fact, at one point a piece is re-enacted in slightly different words, although not spontaneously. This is exposition arrived at through improvisational exploration. The product gives the impression that with the experimental process over, it is now hermetically sealed. Outsiders are not invited in. You know that something is happening here, but you don't know what it is. Do you, Mr. Jones? You can't get in. You're not even sure they're in. The audience examines the specimens, perhaps some are missing. It's like looking into a cloud chamber. What we are seeing is residue. Because Anton Chekhov's characters often harbor an irrational reality inside their heads, usually a conventional, psychologically motivated directorial approach is applied. This production, however, is the anti-Method. Under the direction of Dan Rothenberg, who emphasizes theatricality, the performance piece doesn't spring fully formed out of the head of a writer, only to be tweaked in workshops and rehearsal. Resulting from a collaborative process aimed at discovering a way of acting around a particular idea or junction of ideas, the company accumulates philosophical implications, mental images and heaven only knows what. Only later is it lassoed and reined in for repeatability. Although perhaps no longer improvisational, the result is stimulating theatre, with the triune brain the apparent point of departure and, after cavorting and intermingling, Chekhov the destination, sort of. Pig Iron, ten years old, is a steady center in a loose, inter-related array of experimental theatre companies in Philadelphia. Curiously, Pig Iron has no permanent home base. Something about not being comfortably settled in a particular location makes them even more attractive, makes you want them to remain homeless and searching. For this performance the second floor of the Latvian Society provides a wonderful space for digging up an old samovar and other stuff out of a brain. Reviewed by Kathryn Osenlund based on 03/29/07 performance at the Latvian Society of Philadelphia, 531 N. 7th St.